Acting with an Accent: New York City by David Alan Stern has been used by thousands of collage theatre programs as well as by both amateur and professional actors. Each CD is an hour long program that unlike other programs that only shows you how to imitate the dialect; Acting with an Accent teaches you step-by-step the intonation, speech rhythm, muscularity & resonance, and pronunciation of each language. 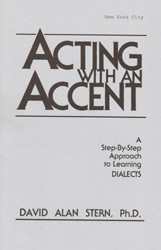 The Acting with an Accent dialect lesson includes a CD with the course and digital step-by-step instruction. Returns will not be accepted for open CD’s or DVD’s.